The last thing I expected to encounter on this island are vestiges of the original inhabitants. I’m near the town of Santa Lucia, right in the middle, and am gazing at the Fortaleza Grande, a huge craggy outcrop. This was the site of the last battle of the Guanches, the indigenous people, as they struggled to resist the Spanish army in 1493. It’s said they threw themselves off the top, rather than be captured and you can still see remains of defensive walls and caves where they lived. In fact recent studies show that most Canarians have inherited some DNA from the Guanches and they weren’t wiped out at all. They originally arrived from North Africa around 1000BC and their Berber features could have reminded the Spanish conquistadors of their Moorish past. As a result there was much intermarriage, although those who continued to fight were put to death. Excavation is still going on around Fortaleza Grande but there’s a new Centre of Interpretation nearby where you can find out more. 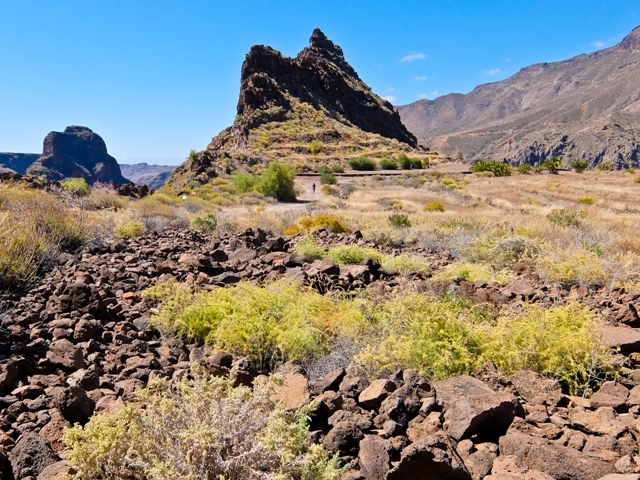 This is one of the destinations on the Aboriginal trekking route which the 5th Gran Canaria Walking Festival will be offering in November 2016. There will be six themed hikes, taking in summits, Laurisilva forest, a water route and even a couple of astronomical night hikes. 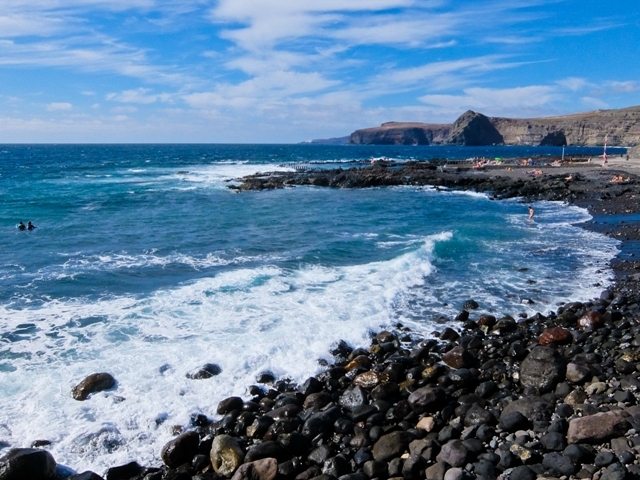 Every day participants will be picked up either in the South at Playa del Inglés, or in the capital, Las Palmas, and experienced guides will lead the walking tours. 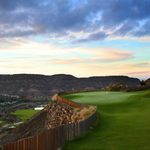 The big surprise in Gran Canaria is how unspoilt it actually is. Most tourist development is concentrated down south and the interior is almost empty, populated by extinct volcanoes, deep ravines and indigenous pine forests. I’m here in early June, colourful flowers are blossoming everywhere and although the sun’s out, it’s not too hot for walking. My first hike is one offered by the Walking Festival, and begins at La Cruz de Tejeda, right in the mountainous heart at an altitude of 1580m. There’s a gradual climb up through the pines then it’s a ridge walk sloping gradually down. 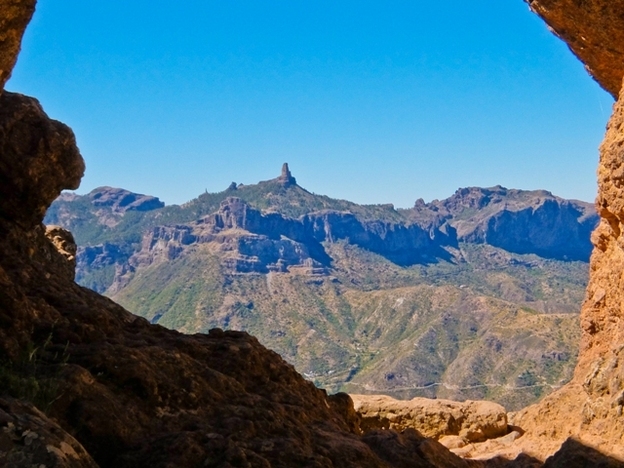 The views across to the Caldera de Tejeda are stunning, with Roque Nublo and Roque Bentayga, two freestanding volcanic pillars dominating the horizon. To the North the peak of Teide on Tenerife is clearly visible. The path passes the Cuevas de Caballero, caves with aboriginal rock engravings, before descending to the village of Artenara, at 1270m the highest on Gran Canaria. 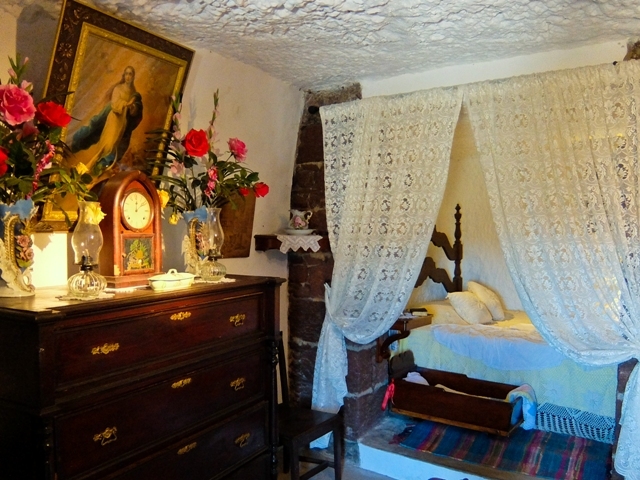 Some of the houses are built into the rock and the chapel of the Virgen de la Cuevita, dating from the 18th century, has a cave to itself. One of these troglodyte dwellings has been turned into a museum and furnished as it would have been in the 19th century, with living room, bedrooms, and kitchen. It’s surprisingly comfortable, warm in winter and cool in summer, although you have to be careful not to bang your head. Of course, back in the day the caves had no toilets which led to the Canarian expression “Váyanse pa´las tuneras” which roughly translates as “Go and pee in the cactus”. I do indeed do that as it’s a fitting end to the day’s hike, an easy 8 km. 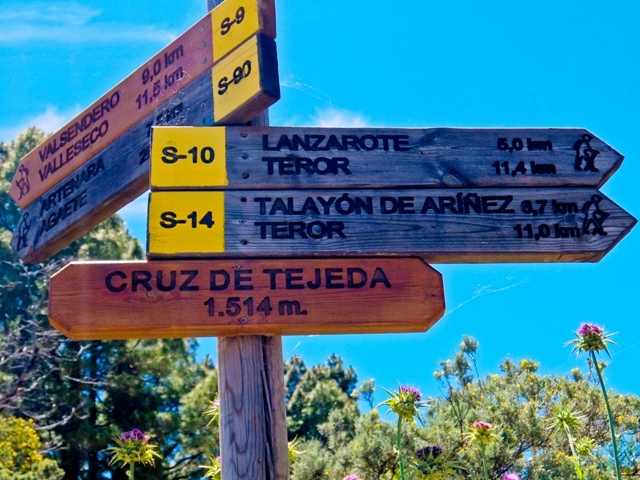 Next morning I start again at Cruz de Tejeda and walk in the opposite direction, due north to the town of Teror, famous for being the site where the Virgin Mary revealed herself in a pine tree to a group of shepherds in 1481. The spot became a place of pilgrimage and the 18th century Basílica de Nuestra Señora del Pino now stands imposingly in the Plaza del Pino. The town also has marvellous examples of typical colonial Canary houses with colourful wooden balconies. I arrive when the Sunday market is in full swing and enjoy tastings of local cheese, tangy olives and freshly baked breads. 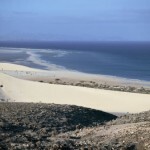 My final day takes me to the North West of the island, and the Tamadaba National Park. This is home to one of the island’s best preserved indigenous pine forests and the ancient trail was long used by locals collecting wood for fuel. Inside the forest, all is fairly level but it soon descends steeply, passing caves dug into the crags for storing grain, and there are spectacular views of the coast and the Agaete Valley. At the bottom, the temperature suddenly rises as the valley floor has its own microclimate here and it’s lush with fruit trees, coffee bushes and grape vines. It’s worth a stop at Bodega Los Berrazales to sample their excellent wines and sip their coffee before the final slog down to Puerto de Las Nieves. Fortunately they’ve transformed the old salt pans into sea water pools so I soak my aching feet and have a chance to cool down before lunch at Roca Negra Hotel & Spa. During three days of walking I’ve been impressed by the well signed network of trails that criss cross the island. The paths are well maintained and at every turn there are stunning vistas of the coast and mountains, to say nothing of the technicolour flora. 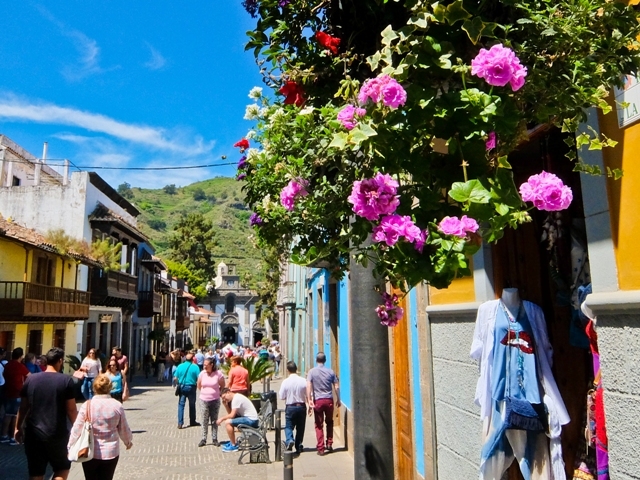 Even better, every village seems to have a good restaurant, serving Canarian dishes, mainly to local people, and dispensing carafes of excellent wine. You’ll need a car, or will have to rent taxis, if you’re going to explore these trails, but the Walking Festival is an easy way to sample the many delights of the island. 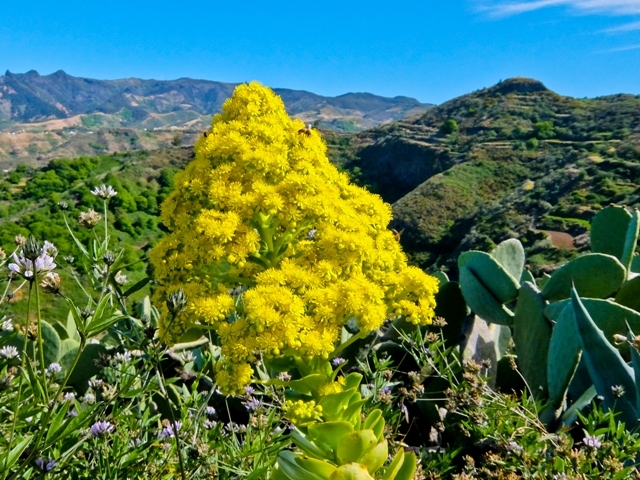 The Gran Canaria Walking Festival runs from 2-6 November 2016. Hikes cost between 18-25 euros per person or you can do the whole lot for 120 euros. 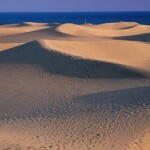 Gran Canaria Active has information about activities on the island. Gran Canaria has tourist information. Hotel Mondalon makes a good base, just outside Las Palmas. Iberia Express flies direct from Heathrow to Las Palmas.